LONDON, UK, November 18, 2015 (ENS) – The British government today proposed to close all coal-fired power stations by the year 2025 and switch the nation’s power generating fuels to natural gas and nuclear. Now, when the planetary temperature is rising more quickly than expected, the nation that started the Industrial Revolution with coal-fueled factories is backing away from the fossil fuel as an energy source. The Cottam coal-fired power plant is on the west bank of the River Trent, eight miles from the market town of Retford, Nottinghamshire, England. (Photo courtesy EDF). “For centuries coal has played a central role in our energy system. But it’s the most carbon intensive fossil fuel and damages air quality. Gas produces half the carbon emissions of coal when used for power generation,” said Energy and Climate Change Secretary Amber Rudd. 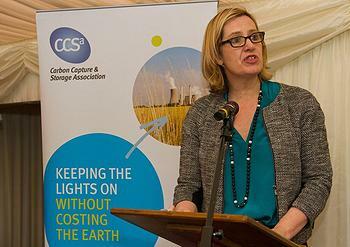 Rudd signalled her intention to develop a “cleaner, more secure energy network” by holding a public consultation on closing coal fired power stations in 10 years. “But let me be clear, we’ll only proceed if we’re confident that the shift to new gas can be achieved within these timescales,” she said. 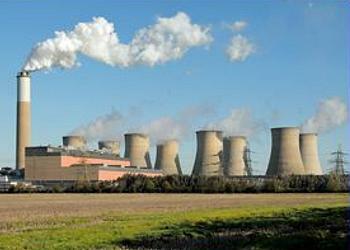 The minister added that nuclear power has a central role in the UK’s energy future. “We are dealing with a legacy of under-investment and with Hinkley Point C planning to start generating in the mid-2020s, this is already changing,” she said. The Hinkley Point C nuclear power station is a project to construct a 3,200 MWe nuclear power station with two European Pressurised Reactors in Somerset, England. Rudd said the government is planning for an entire “new fleet of nuclear power stations…” and that building just one nuclear station would be a mistake. On the hunt for what Rudd called “low cost, low carbon energy,” the government plans to explore Small Modular Reactors, nuclear power plants about a third the size of current generation base load plants. These factory-fabricated reactors can be transported by truck or rail to a nuclear power site. “Perversely, even with the huge growth in renewables, our dependence on coal – the dirtiest fossil fuel – hasn’t been reduced. Indeed a higher proportion of our electricity came from coal in 2014 than in 1999,” she explained. “One of the greatest and most cost-effective contributions we can make to emission reductions in electricity is by replacing coal fired power stations with gas,” said the minister. “The UK Government’s ongoing addiction to fossil fuels sends a terrible signal to crucial Paris climate talks, starting in a fortnight,” Bullock said. Frack Off, the Extreme Energy Action Network, has been fighting gas extration by fracking because they believe the technology behind it is harmful to air, water and public health. “The evidence from the U.S., Canada and Australia, where tens of thousands of shale oil and gas and coal bed methane wells have already been drilled, that fracking destroys water supplies, air quality, and people’s health has been mounting for years and is now becoming very difficult to ignore,” the group said. The nonprofit Communications and Management for Sustainability, pointed out that Rudd hasn’t even dealt with last weeks disaster. A letter from Rudd leaked to “The Ecologist” shows that she misled Parliament by promising the UK was “on course” to deliver on its renewable energy targets – when in fact there is a delivery shortfall in 2020 of almost 25 percent.